Bubbles are so much fun for kids! 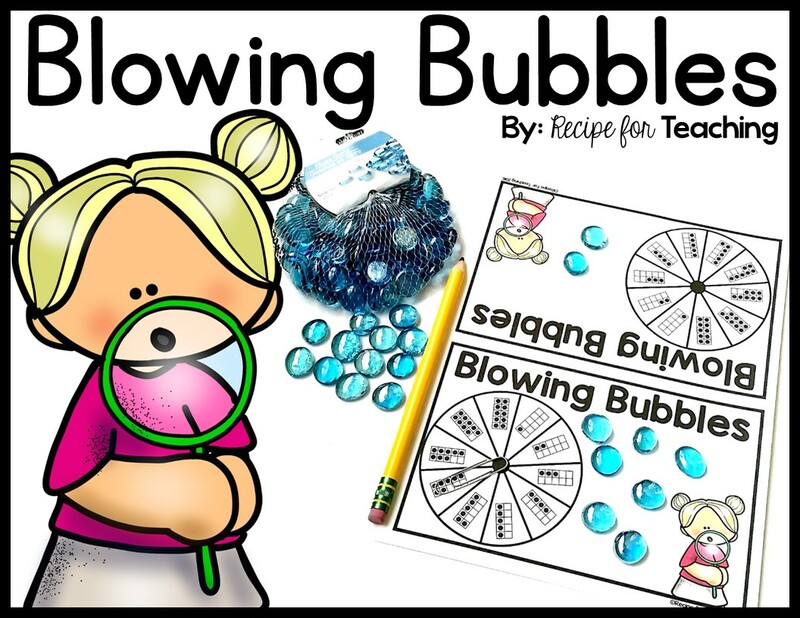 This Blowing Bubbles Math Game is perfect for students to pretend they are blowing bubbles while counting out gems that look like bubbles. This activity could be used as a math warm-up, a math lesson, at a math station, or at home with your own children to practice counting. The Dollar Tree has these amazing blue gems that I am pretty sure young kids think are jewels. They are always an engaging manipulative for my students and they are perfect to use for this activity because they resemble bubbles. To prepare this game, just print the Blowing Bubbles game board and recording sheet. Laminating the game board and recording sheet or putting them in a plastic sleeve is a great idea. A pencil and paper clip are all that is needed for the spinner. If you want to have your students use the recording sheet, they will need a dry erase marker and eraser. The game board is organized so that two children can play this game while sitting across from one another. Students use a paper clip and pencil for the spinner. They just put the pencil on the center of the spinner, inside the paper clip, and give the paper clip a flick. When the paper clip stops spinning, they look to see what ten frame it landed on. This is how many blue gems (bubbles) they count on their Blowing Bubbles game board. Their partner does the same thing on their side of the board. Students can then share with their friend how many bubbles they each have and who had more/less. They can also compare who has more/less by recording on the recording sheet. The recording sheet is optional for this activity and is a great way to differentiate for the needs of your students. Included in your FREE download are two versions of the game. One version has a spinner with ten frames representing numbers 1-5 and the other version has a spinner with ten frames representing numbers 1-10. This allows you to meet the needs of your students when they are playing the game with a partner or in a small group with the teacher. 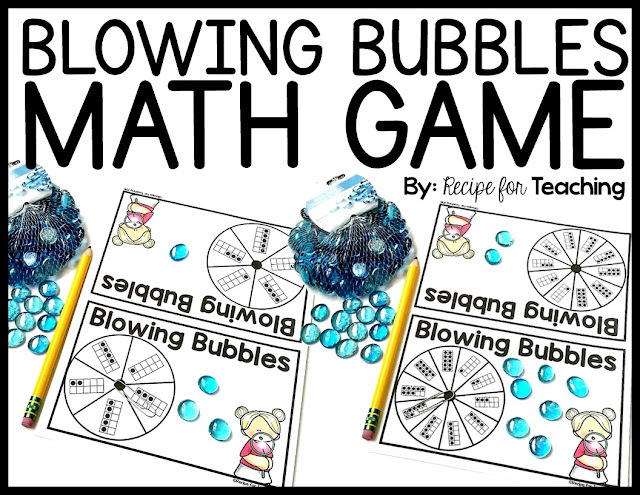 Ready from some Blowing Bubbles Math Game fun?! Click the image below to grab your FREE download! My friend Alex, from The Kindergarten Connection, and I have teamed up to share two FREE bubble themed downloads using these blue gems from The Dollar Tree. Just click the image below to head over to her blog and grab your FREE "Fishy Bubbles" alphabet activity!